Oh my this picture does not do Lucy's "kissing tonsils" justice. They are so big. 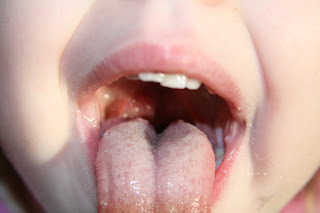 During Christmas time we all had strep throat, well I looked in all my kids throats and was astonished at what I saw in Lucy's mouth. I thought for sure she had strep as well. So we went to the doctor and to my knowledge they said she has kissing tonsils and you couldn't even see her boxing bag in the back of her throat, it's so weird. The specialist told us in most cases he would leave them in but she was the exception they were so big and she is so effected by her sleeping, and breathing that they needed to come out. So her surgery is scheduled for tomorrow at 6:30 a.m. as the week has progressed I have gotten more uptight and nervous about this. She had ear tubes put in so she has done anesthesia before but it's always nerve wracking no matter what. She is so strong and we are hoping for a quick and as painless as possible recovery. My heart really goes out to those parents and family members who have real serious health conditions and deal with these things on a regular basis we really have been blessed. On a lighter note my doctor asked if either Scott or I had ear tubes, or tonsils and adenoids removed. Of course Scott answered yes. The doctor said "don't you know your suppose to ask these things before you start producing children with them".........oh well they are all doomed I suppose. You will be in the prayers of Grandpa and Grandma Lashmett. Count it as a blessing she will probably never remember. We will be thinking of you guys. I completely understand how tough that is as a Mom. Been there, done that. Think it was harder on me than Deaven. Good luck!! I had my tonsils out as a 3 year old....must be something in the family. We hope all goes well and will keep Lucy in our prayers!! That is so bizarre! I have never heard of it. Best of luck to you guys! Having a child in surgery is no fun but they bounce back so quick and are amazingly tough! Much love!!!! I just saw that you posted about it. Glad so far everything is OK. Give her loves from us! We hope everything goes well! We hope she recovers quickly. We will be thinking of you all! I have these, and trust me, they hurt!!! !